Vegan chef, holistic nutritionist, and author Afya Ibomu is known for creating scrumptious vegan dishes with a soulful twist. 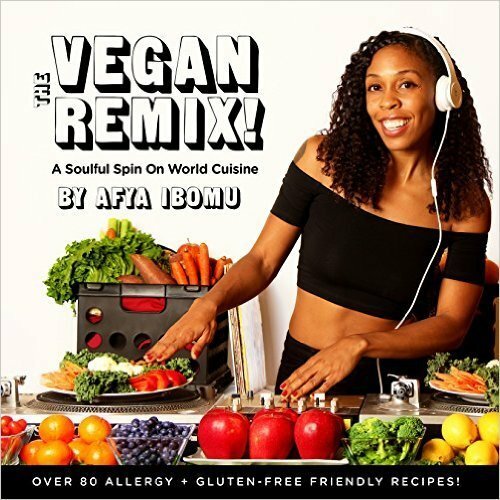 Her new landmark cookbook The Vegan Remix features over 90 modern and ethnically diverse vegan recipes from around the world, soulfully remixed and allergy-friendly; 100% gluten and dairy free with soy, grain and nut free options. As Erykah Badu writes in the foreword, "Afya is right on with her spin on healthy eating!" Setting the table for a new global groove in vegan cooking, The Vegan Remix draws inspiration from cuisines such as Ethiopian, Indian, Caribbean, Asian, Italian and traditional Soul Food. Blending these colorful cuisines results in exciting and delectable recipes like: • Seoul To Soul "Chikn" And Waffles • Spicy Singapore Noodles • Ital Stew • Miser Wat (Ethiopian Spicy Lentils) • Aloo Gobi (Indian Potatoes and Cauliflower) • 5 Spice Rice Crispy Treats Covering breakfast, soups and stews, main dishes, snacks, beverages and more, Afya delivers her nutrition expertise, original recipes and best brand recommendations. In addition to over 30 full color food photos, there are nine classic album covers; from artists such as Chaka Khan, Roy Ayers, Diana Ross, Rihanna and even Dr Dre's The Chronic; chopped, screwed and visually remixed, all starring the lovely Afya.As an extra cherry on top, Afya shares some of her favorite music playlists (From Red Hot Chili Peppers to JayZ) to turn up the flavor of the cooking experience. For anyone interested in cooking and enjoying great tasting food, improving their well-being or adding delicious variety to their special dietary needs, The Vegan Remix's global buffet of recipes offer innovative, plant-based cuisine that rocks! Her cookbook The Vegan Remix and a collaboration book with hubby Stic, Eat Plants, Lift Iron, will be released in 2015. Stay Connected with Afya for healthy inspiration tips recipes and more on social media (FB, T & IG) @AfyaIbomu.